At the Prolight+Sound International Press Award, also known as the pipa award, SGM was nominated for the Q-7 in the category of best lighting product up against Robe BMFL and Martin Professional Mac Quantum Wash. The multi-purpose extremely bright luminaire Q-7 RGBW duly won the prestigious award. Journalists of more than 100 dedicated special interest magazines from all over the world were called upon to nominate and vote for the best equipment on the market and thus they selected the Q-7. 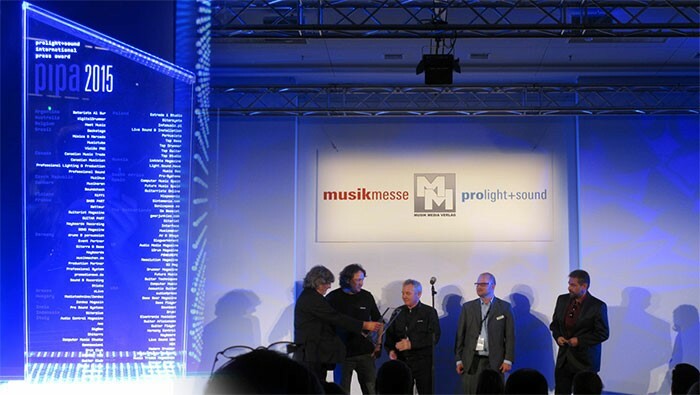 The pipa Prolight + Sound International Press Award has truly established itself as the 'Grammy' of the industry, so it was with great honour that SGM’s CEO Peter Johansen and MD of SGM Deutschland Michael Herweg accepted the award. “To be recognised for this ground-breaking LED fixture is amazing. It quickly became an industry standard and I am proud to see it implemented in so many great designs. During this show, you will see it also in PRG’s Festhalle, which is packed with SGM products,” explained Peter Johansen. The Q-7 is a low-profile and compact RBGW flood, blind and strobe containing 2,000 powerful LEDs providing 28,000 lumens. It is also available in as a Q-7 W with a pure white light output offering a stunning 60,000 lumens – unprecedented in the industry. With this recent acknowledgement from industry experts and with the many installations and tours worldwide, the Q-7 has been established as the product to watch.